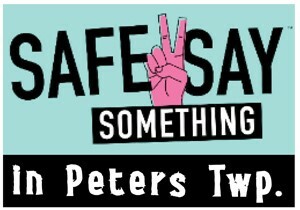 As you know, providing a safe and secure environment for our students and staff is our highest priority in Peters Township Schools. Last year, we added a Safe School Tip Form to each school’s website to allow students and parents to anonymously communicate any threat of danger they may be aware of or to report cases of bullying, drug or alcohol related issues, or other safety concerns. Reported issues are quickly filtered through the 9-1-1 system and District Administrators depending on the nature of the issue. Studies continue to confirm that students in crisis often share this information with their peers, and S2SS helps us to empower student to know the danger signs and to quickly and easily share the information with a trusted adult or through the S2SS outlets. Over the next two weeks, all Middle and High School students will be trained on the S2SS program. Additional details on the program, may be found under the School Safety page of the District website. Administrators will be attending PTA meetings throughout the District to share more about the program.